I had not given the weak storms much notice today. I went outside at 2pm and a crisp updraft and interesting anvil mammatus from a weak storm near Robertson grabbed my attention. I chased and ended up at Barren Grounds on the Illawarra escarpment behind Jamberoo. A very small rain free base persisted and actually moved S/SE along the escarpment. Now the really strange thing was the rotation of the base, quite visible and persistent. 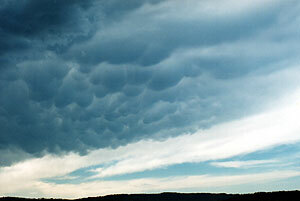 No rain, no CG's - in most other aspects a very benign storm, lots of anvil thunder and strong mammatus. The base died as soon as the edge of the escarpment was reached, and did it die quick. The rotation of the base was most probably just at base level only and the product of local surface wind convergence. 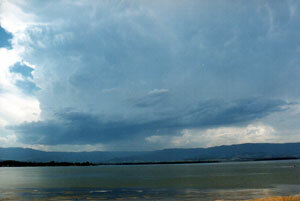 At the stage the above photo was taken the base was located only 2 kms inland from the escarpment edge. The winds on the right and rear of the photo were W/NW, whilst a E/NE seabreeze was working inland as far as were I took the photo from. 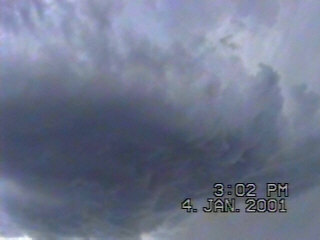 This video still shows the rotation more clearer. 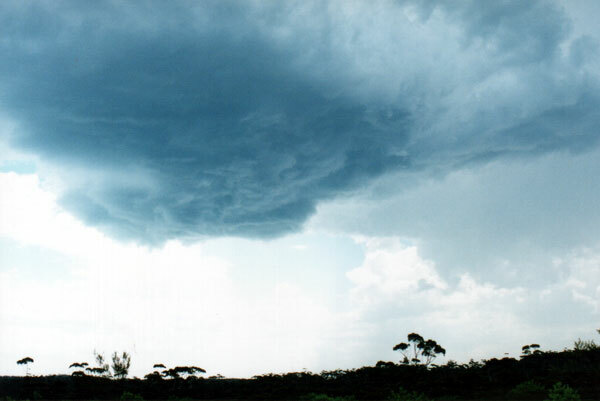 The updraft can just be seen above the cloud collar. The updraft went all the way up into the anvil.